Perennial woody vine, native to Central and South America, naturalized in Florida and the Pacific Islands; leaves cordate, slender petioled; flowers trumpet shaped, white with a red or purple throat and green or greenish gray radiating stripes. The psychotomimetic active principles of the ancient aztec drug «Ololiuqui» have been found to be alkaloids of the ergot type. Three of the components could be crystallized and identified by A.Hofmann in 1960, i.e. 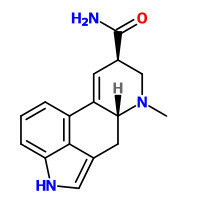 ergine (lysergic acid amide, LSA), isoergine (isolysergic acid amide) and chanoclavin. The same alkaloids were found in the seeds of the related convolvulaceous vine Ipomoea tricolor Cav.